GSMArena team, 26 January 2018. The Xperia XA2 is equipped with a 5.2-inch IPS display of FullHD resolution, making for a flagship-radio 424ppi density. Under a microscope, you'll see a conventional RGB arrangement with equal number of subpixels for each primary color. Sony promises 500nits of brightness and even before we put the XA2 through our display test, it looks very promising. In our tests, the Xperia XA2 demonstrated the same 530+ nits of brightness as the XA1. The black levels have improved a bit since the XA1 and thus the contrast ratio is now very good at north of 1300:1. Sunlight legibility is average on the XA2 as it was on the XA1 and XA1 Plus. AMOLEDs are superior out in direct sunlight, all of them as usual. It's color reproduction where the XA2 fails to impress. Its whites lean heavily towards cyan, to the tune of a DeltaE of around 11. The average DeltaE is an okay 6.4, but the whites you'll probably notice. Subjectively, also the representations of the red hues was quite muted too, particularly if you're coming from an AMOLED, this would be the first thing to notice. Sony has some options to basically make the colors punchy in pictures and videos. The option is within the display settings and you can opt for standard picture tuning or super-vivid. The Sony Xperia XA2 is equipped with a 3,300mAh power pack. We'd call that number the gold standard for a 5.2-inch midranger these days and a much-needed improvement over the XA1. The phone supports Quick Charge 3.0, though our unit came with a 1.5A charger that fills 30% of a depleted battery in half an hour. Some regions might get the faster charger bundled. The XA2 aced all of our endurance tests and posted a respectable score of 92 hours. 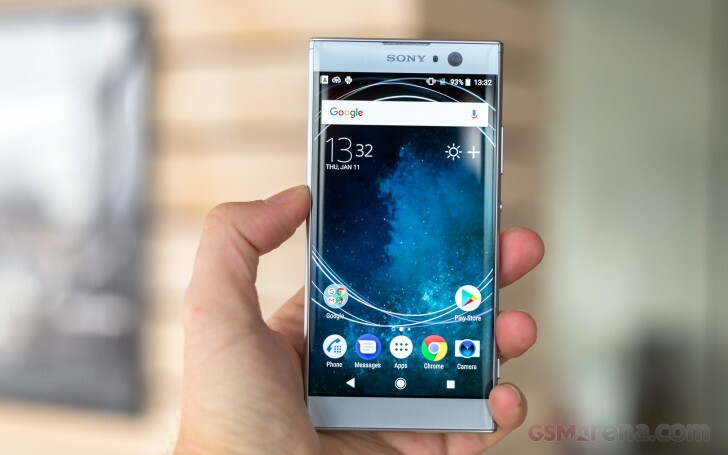 Our endurance rating denotes how long a single battery charge will last you if you use the Sony Xperia XA2 for an hour each of telephony, web browsing, and video playback daily. We've established this usage pattern so our battery results are comparable across devices in the most common day-to-day tasks. The battery testing procedure is described in detail in case you're interested in the nitty-gritties. You can also check out our complete battery test table, where you can see how all of the smartphones we've tested will compare under your own typical use. As on all its other phones, Sony has equipped the XA2 with Qnovo Adaptive Charging and Battery care to help prolong the life of the built-in power pack by carefully controlling charging parameters. The speaker on the Sony Xperia XA2 scored a Very Good mark in our loudness test, an improvement over the XA1's average result. The sound is rich and crisp, with good bass and clean high notes. Updated 09 March: The Sony Xperia XA2 did poorly on the first run when hooked up to an active external amplifier, having very distorted output and low volume. However we found that to be an issue with the phone recognizing there's no impedance to its line-out and not delivering its finest performance. So we tricked it by plugging in a pair of headphones and then removing them just before starting the test and actually got to see what it can do. And as it turned out it it's quite a lot - the output was perfectly accurate. Plugging in a pair of headphones brought the clarity back and all the readings improved, save for the stereo crosstalk, which increased to average. Still the output is very good and accurate, even if loudness wasn't quite the best once more.